Home » Who was the first woman to receive an honorary degree from Georgetown? 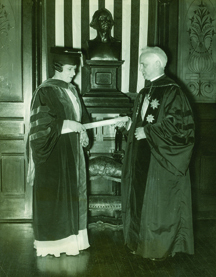 Who was the first woman to receive an honorary degree from Georgetown? The University awarded its first honorary doctorate in 1821. It was not until 1934, two hundred and thirty seven honorary degrees later, that one was awarded to a woman. Genevieve G. Brady. Mrs. Brady, widow of New York financier Nicholas F. Brady, had earlier donated to Georgetown literary manuscripts and first editions collected by her late husband. Included in her donation were the “Crewe” manuscript, textually the most important extant, of Richard Brinsley Sheridan’s The School for Scandal, and the holograph manuscript of Mark Twain’s The Adventures of Tom Sawyer, among the most important surviving manuscripts in the field of 19th-century American letters. Georgetown’s special collections in English and American literature began with this donation. Mrs. Brady was widely known for her philanthropic activities and work on behalf of youth and Catholic education. She had succeeded Louise [Mrs. Herbert] Hoover as national chair of the Girl Scouts of America and was vice chair under Eleanor Roosevelt of the National Women’s Committee of the Welfare and Relief Mobilization which was set up to help those affected by the Great Depression.